Which College Programs Claim the Most Winners? 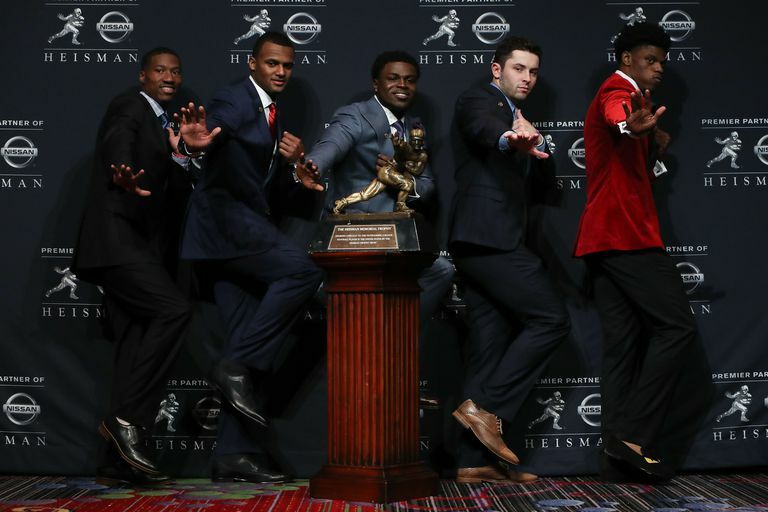 In theory, the Heisman Trophy is supposed to be given each year to the best college football player in America, no matter where they play. But as the list below suggests, it certainly helps if you play for a powerhouse program. Three of the game's most storied programs—Notre Dame, Ohio State, and USC—top the nation with a remarkable seven Heisman Trophy winners each. (Though Reggie Bush of USC voluntarily forfeited his 2005 trophy after the NCAA said he improperly received gifts from agents while still in college.) History-rich Oklahoma, which saw quarterback Baker Reagan Mayfield take home the trophy in 2017, is next with six trophies. Read on to learn the list of all Heisman Trophy winners, starting with the schools that have the most winners. The list provides the name of the school, followed by the number of Heisman Trophy winners it has had, followed by the name of each winner, including the year he won the award in parenthesis. How Many College Football Players Have Won the Heisman Trophy? Do You Know Which Team Has the Most College Football Championships?